Education is the key to a secure and sustainable future, and proper nutrition and physical activity are necessary to optimize a student's learning capability. "Kyan-Mar-Yeh" means "Health" in Burmese and we believe that health is essential to one's learning optimization and quality of life. However, to the underserved communities, health may become a challenging issue and barrier from them to receive the education they need - these barriers include environmental factors, lack of knowledge and awareness, financial instability, as well as lack of access to healthcare had increased their susceptibility towards Non-Communicable diseases. The fact that all of these are preventable, cause us to take action towards these factors. Our volunteers, consisting of Nutrition university students will go and educate the Myanmmar refugee students at a Refugee School in Kuala Lumpur area, as well as conducting Nutritional Assessment to assess their nutritional status - all to be done over the course of 15 weeks. In order to make this happen, we will need your help. 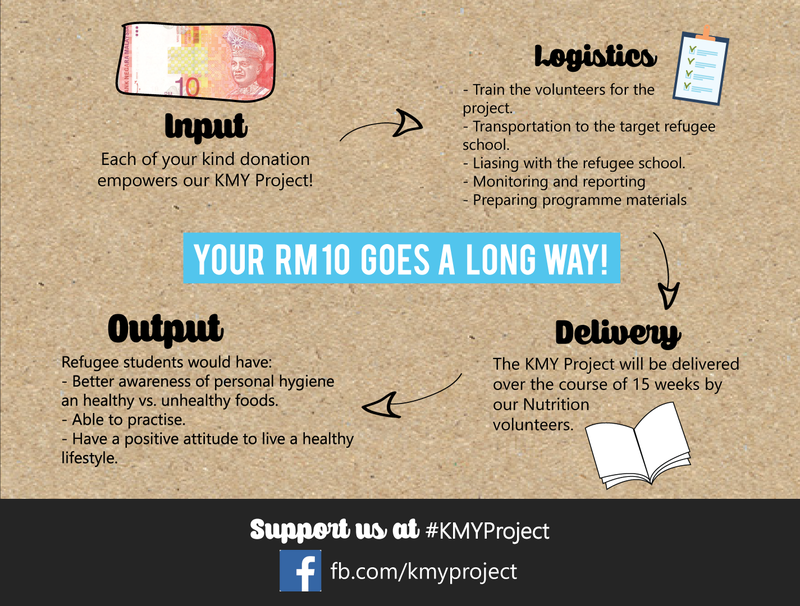 For every RM 10 donated, you are helping a Myanmar student to receive and apply the knowledge and the health assessment. • Appreciation e-mail from us! • Digital handwritten "Thank You" from the Refugee students. • Hall of Fame on our KMY Project and Hands of Hope Facebook page! • Digital handwritten "Thank You"from the Refugee students. • Handmade painting by the refugee students.